Over the course of 84 miles, the Enchanted Circle Scenic Byway runs through a remarkable landscape of towering peaks and deep canyons where wild rivers flow. In this spectacular area of northern New Mexico, you can explore wildlands from the seat of a mountain bike, the saddle of a horse, or the basket of a high-flying balloon. If you can dream up an adventure, you can do it here. And when you’re tuckered out and ready to relax, you’ll have your pick of entertaining mountain towns that suit any taste, whether you like to sip craft beer or stroll through art museums. In the Enchanted Circle, the possibilities are seemingly endless, so we’ve highlighted 10 of our favorite adventures to help guide your way. The Enchanted Circle centers around Wheeler Peak, the state’s highest point, which means the surrounding high country is prime hiking terrain. Around the town of Taos, Devisadero Loop tops locals’ list of favorite trails. It has a storied history, too — devisadero means a “lookout” place, and Taos Pueblo people once used the point to stand guard against invaders. At Taos Ski Valley, a quick two-mile (one-way) trail ascends to a glistening alpine lake and takes you through the pristine landscape of 20,000-acre Wheeler Peak Wilderness. Outside of Red River, the Columbine Hondo Wilderness beckons hikers seeking solitude and the gorgeous wildflowers that help give the area its name. For an unforgettable experience, join an outing with Wild Earth Llama Adventures for a walk with the surefooted camelids along the Columbine Trail. Another option is to head to the Rio Grande del Norte National Monument, where you can trek across high-desert mesas and descend into the 800-foot-deep Rio Grande Gorge. For a true Western experience, saddle up to explore the Sangre de Cristo Mountains. 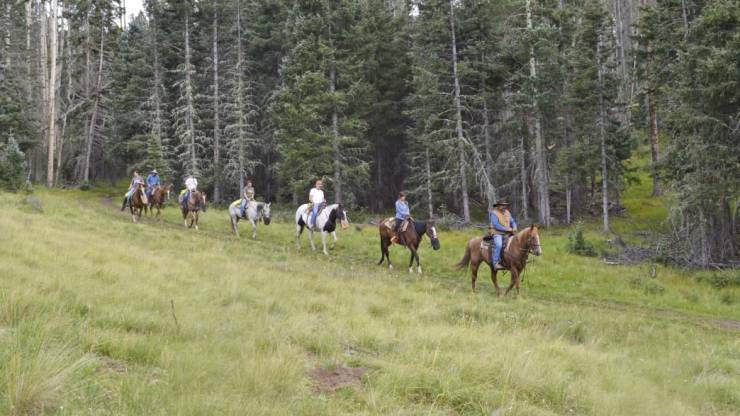 Several stables offer trail rides with seasoned guides, including Red River Stables, Bobcat Pass Wilderness Adventures, and Nancy Burch’s Roadrunner Tours. The Enchanted Circle is home to epic off- and on-road routes for cyclists. 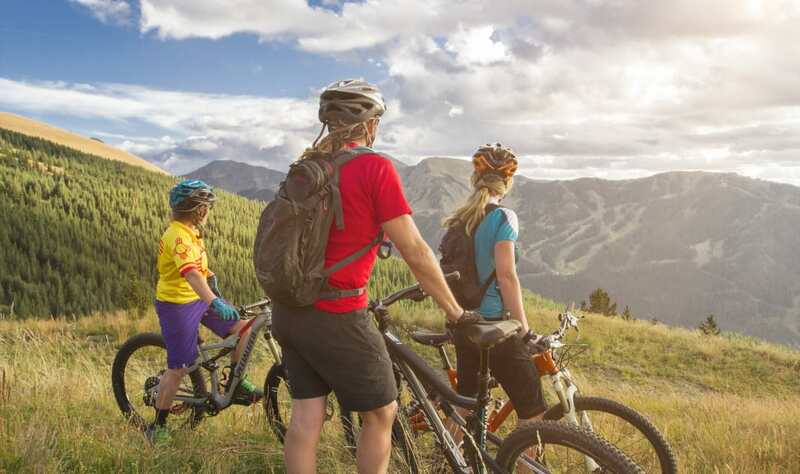 Angel Fire Bike Park at Angel Fire Resort boasts more than 60 miles of purpose-built, lift-served mountain-biking terrain, making it the largest bike park in the Rocky Mountains. It’s so popular that MTBparks.com users voted the park the best in the Southwest four years in a row. In Taos Ski Valley, Northside delivers a high-altitude looped network of singletrack and doubletrack trail on 1,200 acres of private land. Most of the trails are challenging, requiring serious aerobic fitness and technical skills, so intermediate and beginner riders are better served with lower-elevation rides, like those along the West Rim Trail of the Rio Grande Gorge. If you’re a dedicated road cyclist, battle high elevations and rolling mountain terrain during September’s Enchanted Circle Century Tour. This event also includes a mountain-biking component: the Top of the World Mountain Bike Race, which covers a 5.5-mile loop through the Enchanted Forest Cross Country and Snowshoe Area. A hot-air balloon ride is a bucket-list item for many travelers, and New Mexico is a ballooning mecca. The raindrop-shaped, candy-colored balloons fly over the Enchanted Circle nearly year-round — only rain and high winds can ground them. October’s Taos Mountain Balloon Rally treats spectators to views of some 35 balloons flying over the Rio Grande Gorge at sunrise, while June’s Balloons Over Angel Fire festival features balloons over the Moreno Valley. Members of the public can join guided balloon rides with Eske’s Paradise Balloons and Pueblo Balloon, both based in Taos. Anglers can cast for rainbow trout, cutthroat trout (New Mexico’s state fish), and salmon, at Eagle Nest Lake State Park, and Cabresto Lake. 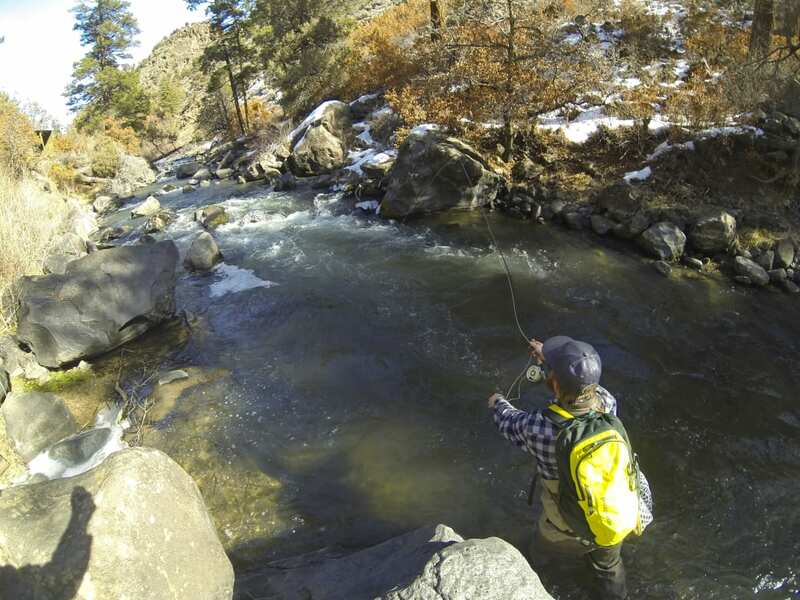 For more fly-fishing action, head to the Wild Rivers Recreation Area, where the Rio Grande and the Red River converge in an impressive canyon. On the Rio Grande, you can chase northern pike and brown trout, while the Red River is home to rainbow trout that are stocked by the Red River Fish Hatchery located upstream. The residents of Taos Pueblo have lived in their stacked-adobe village at the base of the mountains for more than a thousand years. Working in the village, they produce pottery, design jewelry, and craft other varieties of artwork. The residents welcome the public to explore the village, and they offer guided tours that illuminate the pueblo’s history. Some of the best times to visit are during feast days, including September’s San Geronimo feast day, when the pueblo celebrates with ceremonial rites, dances, and meals. The Vietnam Veterans Memorial in Angel Fire began as a tribute to David Westphall and the 17 Marines that lost their lives with him in a Vietnam War battle. However, the memorial honors all members of America’s armed forces, and its chapel welcomes visitors for quiet contemplation and remembrance. The Rio Grande River can be breathtaking. It’s not only home to world-class whitewater, but it flows through a thoroughly wild corridor where eagles soar and the shores are home to ancient petroglyphs and hot springs. 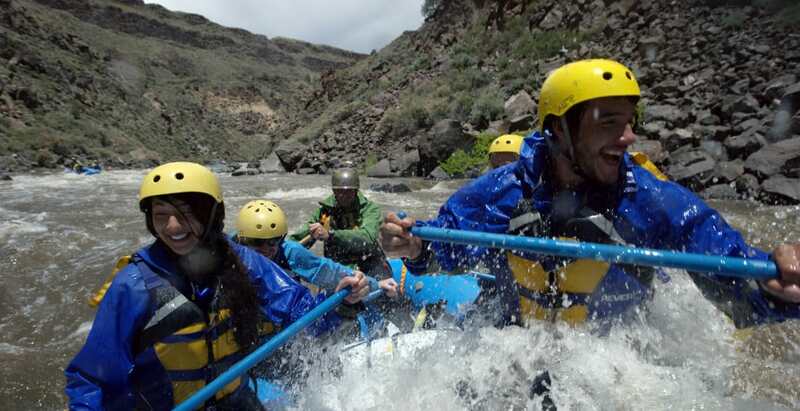 One of the best ways to experience the Rio Grande is to join a guided trip with a qualified outfitter, such as Los Rios River Runners and Far Flung Adventures, two of the longest-running guide services. You can choose from a half-day trip to a two- or three-day trip where you’ll camp in the wilderness. The Enchanted Circle is riding the craft beer craze, and its breweries are the perfect places to grab some post-hike suds or listen to music. Taos Mesa Brewing has three Taos-area taprooms, and its original locale, on the Taos sagebrush mesa, has become a live-music mecca. Tucked away in Eagle Nest, Comanche Creek Brewing is unusual, as it sits at 8,400 feet of elevation. How many chances do you get to enjoy some high-altitude beer sampling? A newcomer to the scene is Red River Brewing Company, where you can try a classic ale like Lazy Bear Blonde or something heftier like the Prospector Porter. Also new to the area is Enchanted Circle Brewing, which not only has a wide range of beers, but also a food menu that includes everything from gyros to burgers to pork sandwiches and steaks. Historically, artists have flocked to Taos, and its museums and galleries carry on that tradition. The Harwood Museum of Art chronicles the town’s art evolution, starting with Native American and Hispanic artists, through the Taos Society of Artists and the Taos Modernists. The namesake heiress’s impressive collection is on display at the Millicent Rogers Museum. If you’re a collector, you can shop at galleries like Sage Fine Art, which represents local artists, and Kenneth Wyatt Fine Art, which specializes in Western paintings. Artists and literary figures found ample inspiration in northern New Mexico, including author D.H. Lawrence, whose home is open for tours. It’s also possible to tour the homes and studios of artists, as Questa artists welcome visitors to their workspaces in August, and Taos artists open their doors Labor Day Weekend. D.H. Lawrence once wrote about how a New Mexico morning could stir a person’s soul. Once you’ve traveled the Enchanted Circle Byway, you’ll understand what he means. Whether you’re knee deep in a rushing river casting for trout, soaring in a balloon, or enjoying the beauty of a piece of modern art, this place will not only entertain you, but also inspire you. From the solemn grounds of the Vietnam Memorial to the bike trails in the high mountains, this is an area of New Mexico where the adventures are not only plentiful, but often profound.